Sometimes you’ve got a busy week and want something easy, fast and healthy. This is one really simple but satisfying healthy week night dinner. 1 large pack of Asparagus. 1 Teaspoon of Ground Garlic. 1 Teaspoon of Ground Ginger. 2 Teaspoons of Mustard Seeds. 2 Teaspoons of Plain Greek yoghurt. 1. In a frying pan dry heat the spices and 1 of the Teaspoons of Mustard seeds (keeping the other Teaspoon aside). 2. Mix the spices into the yoghurt along with a little salt and pepper. 3. Smear the yoghurt and spice mix over the Salmon, then drizzle with oil. 4. Heat a fresh frying pan then add the salmon. 5. Break the woody ends off the Asparagus, sprinkle with salt and pepper. 6. Get another frying lan and melt the butter. Add the remaining mustard seeds. Once it’s melted cover the bottom of the frying pan in boiling water. 7. Add the Asparagus and poach until just soft. 8. Sear the Salmon for around 5-10 minutes depending on how well done you like it. 9. 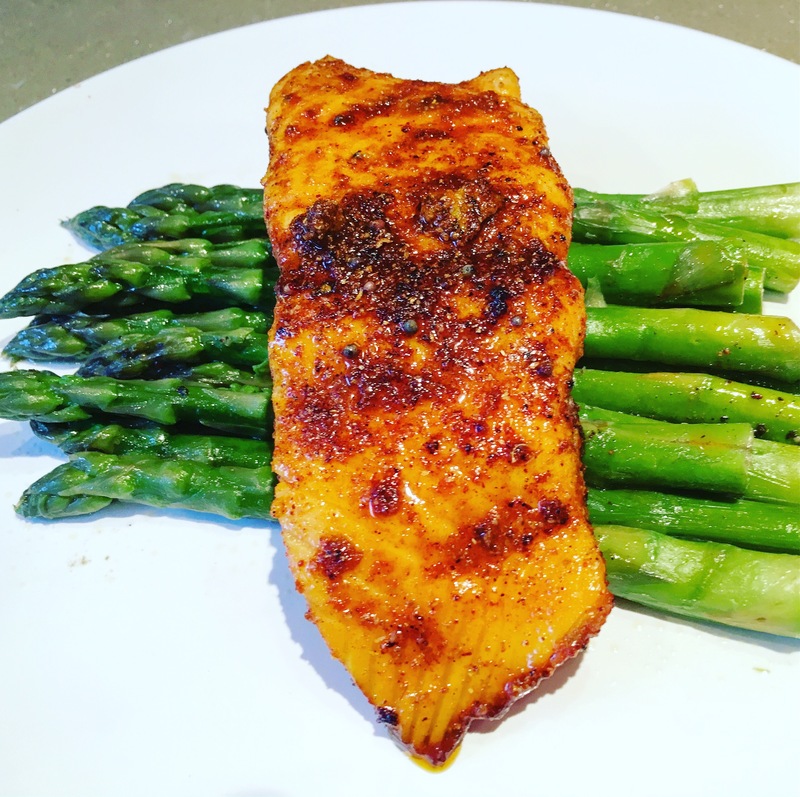 Serve the Salmon on a bed of Asparagus.